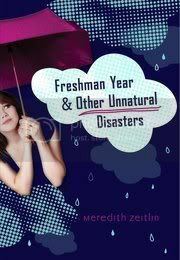 In Freshman Year & Other Unnatural Disasters, we follow new Freshman Kelsey Finkelstein through her first year of high school. All Kelsey wants is to make her mark and to have a really great first year. Unfortunately for Kelsey, things do not work out exactly as she has planned them to. I really love Kelsey’s character. She kept me in stitches with all the mishaps that happen on her first year of high school. I can totally sympathize with her on some of the things that happened; as I definitely remember my freshman year all too well. Her best friends; Cass, JoJo and Em were all wonderfully well thought out characters as well! I really enjoyed the relationships that these four girls had. All of the ‘disasters’ that poor Kelsey went through definitely make the book a hilarious read. From her first kiss, to being back-stabbed by her best friend over a boy, to a school play gone wrong; it all adds up to some really funny situations. Add in some pretty emotional teenage drama, a great storyline and it all comes together into a really fun read. Overall, this book is definitely one of the funniest books I’ve read so far this year. The teenage drama and the fun characters definitely kept me hooked. I am definitely looking forward to reading more work by this author in the future. This really was a great read! I've been hearing nonstop about how hilarious this book is, as well as the main character. I really want to meet Kelsey as well! I've been dying to read this! It sounds like such a fun book! Thanks for the great review! I've been seeing a lot good things about this book! Glad it's funny, I've been looking for something fun to make laugh! Great review, glad you enjoyed it. Definitely want to read this one at some point. I don't read enough funny books and I'd really want to give this one a try :) !! Thanks for the review Christy and for all the great comments you left on my blog ! I just read another review for this one and, coupled with yours, I'm definitely sold on the book. I feel iffy about reading about characters so young, but I can't pass up some good humor. Great review! This one sounds so funny! My memories of freshmen year are very, very fresh in my mind--probably because it's happening right now! :) So, I'm very curious to see how the author portrays it. I'm definitely not a fan of underage drinking but I'm sure I'll still like this one. Great review, Christy! I have to admit that I never really paid much attention to this book, but your review definitely intrigues me. It sounds like a fun and light-hearted read and I'm definitely in the mood for one of these. :D Thanks a lot for sharing! I hadn't really heard much about this book until your review. Sounds like a funny, lighter read that might be good in the summer. I can recall my first year of highschool as well and I can only imagine the distasters she faces. hehe. Glad to know it also has a message in there, and I can imagine your perspective changes if you have children around the same age. I would feel the same! Great review. I might have to check this one out.